There is a small mountain in our garage that's been accumulating over time. A mountain of thrift store beauties just waiting for a bit of love. Hmm, maybe that's the wrong analogy. A mountain would give the impression that it's all piled in one place. I think this is more like... a tornado. I'm sure you can picture it so I'll spare you the actual visual. This week I finally got off my rear-end and plucked some junk from the mess. A little metal lantern with some unfortunate flower-vine things. Now it should be noted here, that I am not one to discriminate against my junk. Being unfortunate looking is not it's fault, I just accept it as a challenge and move forward. A pair of tin snips and elbow grease, and this baby began to take on a new life. Once I removed those vines, and a good layer of dust, there was nothing left to do but paint. Then did an even worse job of randomly adding some grey, Anita's acrylic craft paint in Charcoal. And finished it off by lightly brushing on some Annie Sloan Dark Wax. I knew there was a beauty lurking underneath those nasty ol' vines. Jeannine, that looks amazing! Who would have ever thought to put ASCP on there. Not me! I have a few lanterns around here that could benefit from your talents as well. And a tornado too! I really like what you did. And I think clipping off the little flowers was a good idea too. You gave it a whole new, up to date look. Well done! Love the lantern update. I have thrift shop projects to do too. Very impressive transformation! It looks lovely now!! Wished all my "junk" could transform into this jewel in the rough!! Beautiful! Wow, great transformation. I've got two old lanterns sitting outside practically falling apart and now I'm motivated to see if I can revive them! Love the lantern! What a transformation! I love it! I have a ton of lanterns that are not being used! I never thought of chalk paint! Have a blessed week! Looks wonderful! Who would've guessed it used to be covered in vines?! Great work! 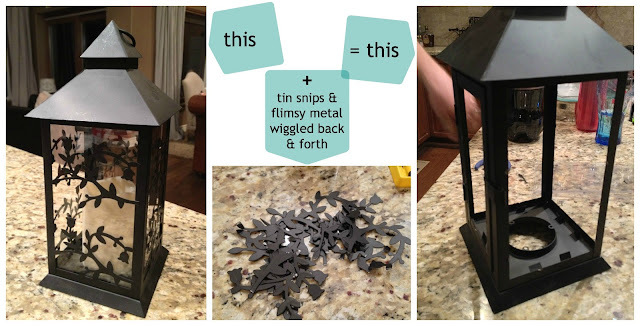 You've breathed new life into this lantern - it's much better! That is such a cute lantern now! Wow, great job! Looks like it came straight from Pottery Barn at a very high price! This is great! I love that paint color. I get a lot of satisfaction out of turning junk into something pretty. Great idea - I have lots of lanterns but some of the colors are just eh! I do have some ASCP and I'll try your technique! Gorgeous! Love the idea of updating lanterns like this! Thanks for sharing! I love this! And I've heard some awesome things about that paint, I'm going to have to try it out. it doesn't look like the same lantern. it is gorgeous and shabby and oh so chic! This would have taken quite a bit of time! I love the results. Amazing lantern. This lamp is for use with a tea light, and I haven't had any problems with the paint at all. I wouldn't think heat resistant paint would be necessary.